Was the room as great as you thought it would be? On a trip to California and Canada this spring, we were “upgraded” twice. The experience made me think about that word, what it really means, and how hotels may use it to actually provide inferior service, while making you feel grateful. The first time, we were upgraded to a suite, at a hotel in Carmel-by-the-Sea. We had arrived late in the evening, due to a day of delays, flying across the country from Florida. The upgrade felt like a reward for having survived the day. Unfortunately, our room had paper-thin walls and windows. We were awakened before six the next morning, by the street sweeper making repeated trips up and down the street outside our second-floor window. Later that day, a family checked into the room next door. We could clearly hear their conversations. Even worse, we might as well have been in the bathroom with them… It was ghastly. We were there for several days with a group of friends. Only one other person had a room with a problem… and they had also been upgraded. Later on the same trip, we were upgraded in a hotel in Vancouver, British Columbia. This time, the experience wasn’t bad, but it could have been. Let me explain… When the elevator doors opened on our floor, the air seemed quite cold. As we walked down the hall to our room, we noticed that all of the doors to the rooms on the right side of the hall were slightly ajar. Cold air drifted out into the hall from each door. When we reached our room, the bellman explained that the rooms on this floor were being renovated. Ours was finished, but many were not. He insisted that he would be happy to take us back down to the lobby and get us another room. We could tell that he was uncomfortable leaving us in the room. He warned that we might hear construction noise or find the hallway dusty. We took a look around the room. It was delightful. We were on a high floor, so street noise would not be a problem. Fresh, new linens were on the bed. The rug was clean and new. The bathroom sparkled. Looking out of the window, we had a view of Christ Church Cathedral across the street, with the Vancouver skyline behind it. We hadn’t heard any construction noise on the walk down the hall. Being firm “bird in the hand…” believers, we opted to keep the room and weren’t disappointed. In each of these cases, the word “upgrade” was used to create a feeling that there was something special about the room we were getting. In the first case, getting a suite for the price of a double room was the enticement. In the second, getting a room that had just been renovated was the reward. What experiences have you had with upgraded hotel rooms? Share in the comments! You can click on either one to see a larger version. 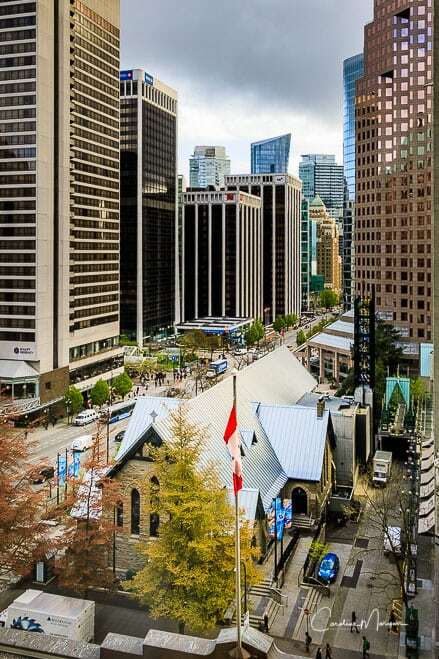 The one at the top was shot out of our window at the Fairmont Hotel Vancouver. The settings were F/8.0, 1/50 sec, ISO 100, 24 mm. Shot with my Canon 5D Mark IV in Aperture Mode. 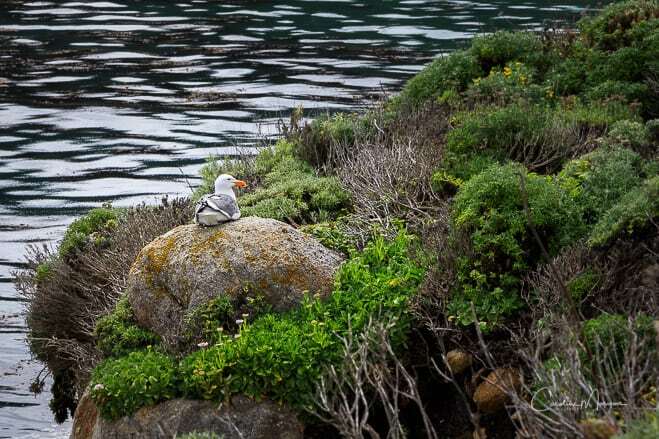 The one below, of the seagull, was shot in Carmel, California, at the Point Lobos State Natural Reserve. If you ever have a chance to hike through the Reserve, it is definitely worth it! The settings were f/18, 1/125 sec, ISO 320, 105 mm. Shot with my Canon 5D Mark IV in Aperture Mode.